One of Penang’s most popular beaches, Batu Ferringhi offers spectacular views of the Andaman Sea. Development of the area started with the opening of the Lone Pine, a small but charming family-run bungalow, in 1948. These days, although numerous resorts line the beach, it retains its quiet, laidback vibe. Those with a desire for more adventure can try parasailing or jet skiing offered on the beach with no appointment necessary. The Peranakans are the descendants of Chinese immigrants who came to the Malay Peninsula starting from the 15th century and married Malay women. Their descendants are called Nyonyas (for women) and Babas (for men). The 19th century residence of Kapitan Cina Chung Keng Kwee, the Pinang Peranakan Mansion provides a rare glimpse into Peranakan culture and its blend of Chinese, Malay, Thai, Indonesian and European influences. Browse more than 1,000 beautiful antique furniture pieces, along with period-era wedding dresses, embroidery and beaded shoes. Nyonyas and Babas who are proud to share their heritage provide guided tours. pinangperanakanmansion.com.my, 29 Church Street. Open daily 9.30am-5pm. Listed as a Unesco World Heritage Site in 2008, George Town’s colourful, refurbished shophouses are now cafés, bars, boutique clothing stores and souvenir shops. Muslim, Buddhist, Hindu and Christian houses of worship are side-by-side, a testament to Penang’s multicultural and multiethnic history. Restored Chinese clan houses, or kongsi, are organized by surnames. Established in the 19th century, clan houses were important places of community and worship for new arrivals from China. 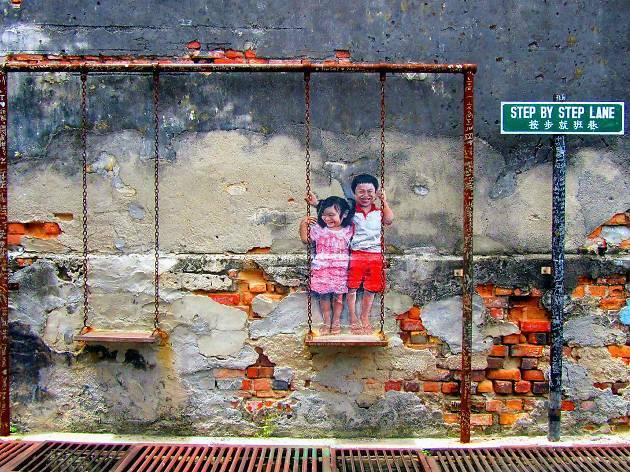 Penang’s history is humorously depicted in graffiti art and steel-rod caricatures scattered on sidewalks, walls and in front of shop houses. The steel rod sculptures were commissioned in 2009 as part of the Penang government’s initiative to revitalise the Unesco site. There are now 52 sculptures made by local artists such as comic book author ‘Lefty’ and cartoonist Reggie Lee. For those who treasure women’s footwear as works of art, the shophouse where Penang native Jimmy Choo learned his craft is marked by a steel-rod sculpture in front. Part bakery, part art gallery and part live music venue, ChinaHouse has something for every type of foodie and art aficionado. Opened in 2011, the multi-concept space occupies three heritage buildings and an open-air courtyard. Seating is a mix of co-working tables and intimate two-seaters. Some tables come with crayons and paper tablecloths to try your skills at sketching. Try locally-brewed craft beer and catch live music on Friday nights at The Canteen, a speakeasy-inspired room hidden inside ChinaHouse. chinahouse.com.my. 153 Lebuh Pantai, open daily 9am-1am. Located in the Straits Quay shopping mall, Nyonya Breeze Desire is a popular eatery that doesn’t get much traffic from tourists. For an authentic dining experience, order the nasi ulam (mixed herb rice) and kacang botol kerabu (spicy winged-bean salad). 3A-1-7, Straits Quay, open daily 11.30am-2.45pm, 6pm-9.30pm. Although food writers tend to lavish less praise on Penang’s desserts than its other food, this little roadside stand just off Penang Road should act as a counter to such attitudes. Since 1936, Penang Road Famous Teochew Chendul has served chendul (or cendol, as it’s more commonly spelled), a sweet concoction of pandan-flavoured rice noodles and red beans in a bowl of coconut milk and ice. The business has expanded and happy sweet tooths can now take their bowls and dine in the comfort of a shophouse next to the stand. chendul.my; 27 & 29 Lebuh Keng Kwee, open Monday to Friday 10.30am-7pm, Saturday to Sunday 10am-7.30pm. Built by the Armenian Sarkies brothers in 1885 (who later built Singapore’s Raffles Hotel and Yangon’s Strand Hotel), the three-storey Eastern and Oriental Hotel exudes colonial charm. The best suites have bathtubs with a view of the Malacca Strait but one need not be a guest to enjoy the hotel. The hotel’s cafés and restaurants serve both local and Western fare. 10 Lebuh Farquhar. No trip to Penang is complete without a plate – or 10 – of char koay teow. The flat rice noodles stir-fried in soy sauce, chili and shrimp paste with a mishmash of ingredients including fishcakes, egg, cockles, shrimp and bean sprouts is a national favourite. The Penang rendition is particularly tasty because of the fresh seafood used. The best versions are at Sister’s Char Koay Teow, Sin War Char Koay Teow and Siam Road Char Koay Teow – though expect to wait in line for nearly an hour at the Siam Road stall. Sister’s Char Koay Teow: 185 Macalister Road; Sin War Char Koay Teow: Pulau Tikus Market; Siam Road Char Koay Teow: Corner Siam Road and Anson Road. Air Itam, which is Malay for ‘Black Water’, may be a small suburb but its culinary reputation exceeds its dinky size. The neighbourhood is especially known for its open-air hawker stalls and Keat Seng has served Air Itam residents since the 1960s. Some old-time favourites are Hokkien mee (Hokkien-style prawn noodles) and koay teow thng, a soup noodle unique to Penang that consists of fish balls, fishcakes and minced meat. 10J, Mk16, Jalan Air Itam, open daily 7am-midday (closed Wednesdays). If you’ve ever wondered about the beautiful floral patterns on your sarong, visit Craft Batik, a batik factory near Teluk Bahang Beach. Originating from the Indonesian island of Java, the craft of batik – using hot wax and coloured dyes on cloth and textiles – is popular in Malaysia too. Visitors can watch the step-by-stop process of different types of batik-making from hand-drawn to woodblock printing. penangbatik.com.my, Mk2, 651, Teluk Bahang, Open daily 9am-5.30pm. 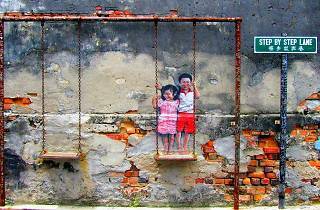 Penang’s west coast is rarely explored by visitors but that doesn’t mean it lacks good food. This hole-in-the-wall eatery in Balik Pulau offers a killer prawn mee or prawn noodles. Here, noodles are soaked in broth boiled in pork bones, which are served with pork ribs, hard boiled eggs and thinly-cut pork slices garnished with deep-fried shallots for crispiness. Corner Jalan Balik Pulau and Jalan Sungai Pinang. On the southwest coast of Penang, Pasir Panjang is one of the island’s secluded and unspoiled white-sand beaches and is reachable after a drive through jungles and durian farms. Pasir Panjang was one of the areas worst-affected by the 2004 Boxing Day tsunami, but today, the beach’s calm emerald blue water beckons for a dip. Not to be confused with the tiny uninhabited island off the southwest corner of Penang, Pulau Betong also spans a small chunk of southwest Penang Island which is home to numerous fishermen and farmers. Browse one of the many fishing villages where seafood is said to be amongst the freshest in Penang. The area is also famous for three types of fruits – durian, cempedak and mangosteen – though other tropical fruits such as bananas and pineapples are also sold here. Why eat durians in a market when you can go straight to the source? Pulau Betong is home to numerous durian orchards but be ready to hike a good 700m uphill for the best durians. Come early in the morning to watch durian farmers drive their motorcycles up the hills while balancing straw baskets on their heads to place the durians. Along the way are rambutan orchards and rubber trees with small buckets affixed to them to collect latex to make tyres. Though climbing to the top of the durian orchard is a feat, the view from above of sprawling farms and rice fields is one that many tourists do not see. Kampung Bakar Kapur. Rent a bike from Audi Guest House and cycle about 15km to Pantai Malindo Beach and back, cutting through a long and picturesque stretch of paddy fields as well as banana plantations and prawn fisheries. The dirt path is easy to follow and chances are you won’t run into other cyclists. You might also want to stop for mee udang, Malay-style prawn noodles made with fresh prawn. Late afternoon is a good time to set out as the breeze makes for a pleasant bike ride. Audi Guest House: 609 Jalan Pulau Betong. While not exactly a beach – there’s no stretch of sand – Pantai Malindo is a natural wonder. Follow the rocky path out to the sea and you’ll feel like you’re standing on the edge of the earth – or at least the edge of Penang. During low-tide, the ground takes on the appearance of dried mud with a few plants sprouting from between the cracks. The sunset view of the Malacca Strait and Pulau Betong (the island) is hard to beat and it’s almost guaranteed that you won’t have to share it with other travellers.